The holiday season is fast approaching, with that comes the need to add something a little special to your embroidered designs. Supertwist thread delivers sparkle, shine and the ability to stand out from the crowd. Madeira’s 30 weight Supertwist thread is ideal for embroidery, festoon work, ornamental seams and may other decorative applications. The addition of Supertwist to your inventory can prove to be a wise investment, setting you apart from your competition. 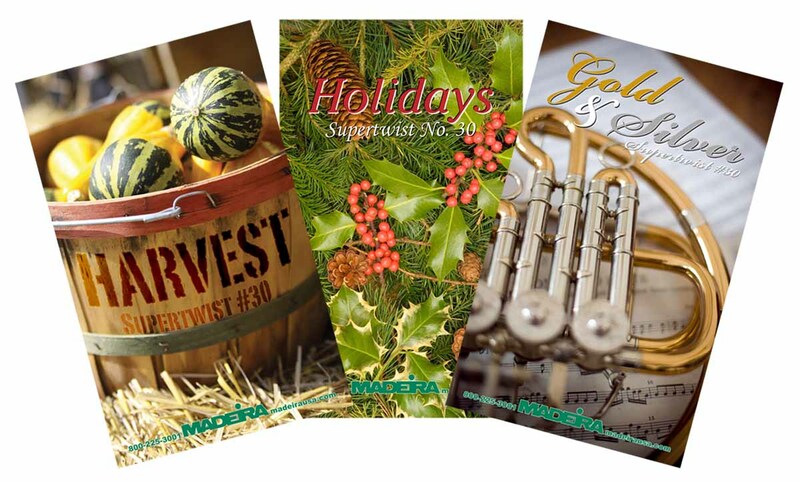 Madeira has 3 great Supertwist kits to help celebrate the holidays in style! Our Harvest, Holidays and Gold &amp; Silver kits will help add that special touch to your autumn and winter designs. Each kit contains 10, 1,100 yard spools, a Madeira snip and two trays of #90/14 ballpoint needles in a plastic storage box for your convenience. As an added bonus, each of these kits feature a FREE downloadable design by top digitizers in the embroidery industry! Visit: http://madeirausa.com/ST_kits to see what all the buzz is about!